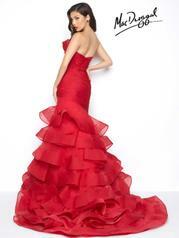 Create your own red carpet moment in this Mac Duggal gown. The layered strapless neckline creates drama and doesn't stop there, taffeta fit and flare with ruched bodice cascades into a tiered trumpet skirt. The back is just as dramatic at the front with an exaggerated sweep train fit for a queen.